GERMAN industrial-machinery manufacturer Siemens – which has a gas-turbine service centre in Aberdeen – saw net profits fall sharply during the three months to June 30. Earnings for the quarter sank to £438.6million, from £1.2billion a year earlier, although revenue was up by 2.4% to £15.6billion. Profits were hit by an arbitration award as a result of Siemens leaving a nuclear joint venture with French conglomerate Areva. Siemens took more than £875million in one-off charges, including nearly £600million for the Areva break-up. The Munich-based group has been in Aberdeen for more than 20 years. Its newly refurbished base in Kirkton Drive, at Dyce, is one of its key centres for gas-turbine servicing. The £1.5million redevelopment resulted in a 50% increase in accommodation for a workforce of about 50. Siemens said recently the Aberdeen site had a very strong order book and it planned to increase the amount of work being done in the north-east to meet the needs of a global customer base. 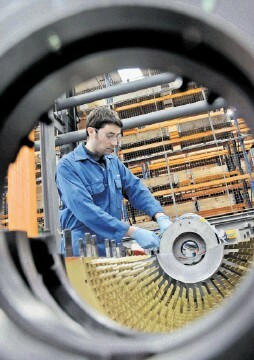 The group’s UK division employs about 16,000 people, including about 500 at its Lincoln-based gas-turbine servicing business.